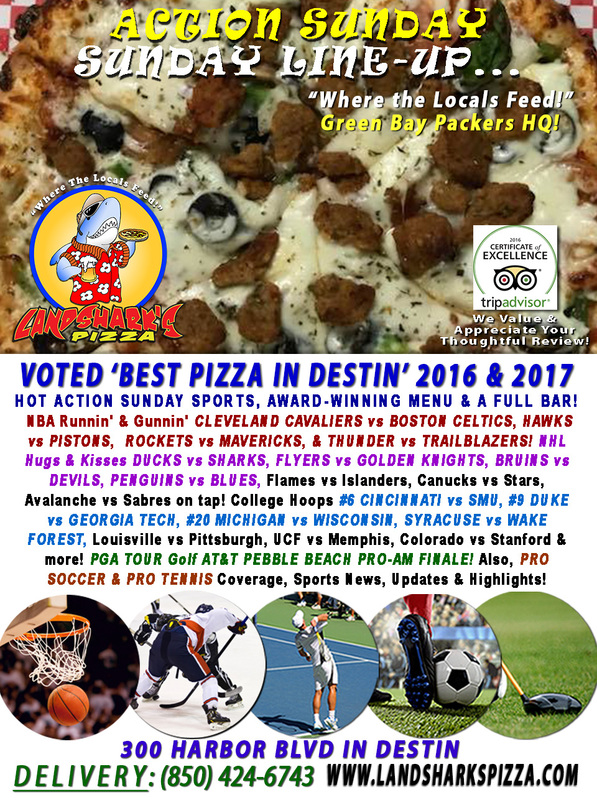 / Best Award Winning BBQ Destin FL / Landshark’s Action Sunday CAVALIERS vs CELTICS, Red-Hot NHL & Fastbreak NCAA Hoops, Great Menu & Full Bar! 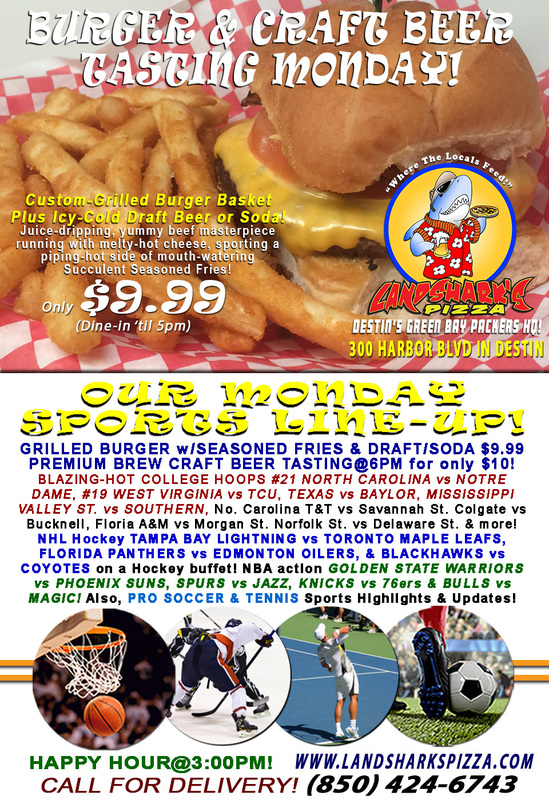 Landshark’s Action Sunday CAVALIERS vs CELTICS, Red-Hot NHL & Fastbreak NCAA Hoops, Great Menu & Full Bar! What a wild, crazy and FUN MARDI GRAS-time week we’ve had – WOOOOOOOO LORDY! So, with all the good times we’ve enjoyed, we don’t see any reason to stop now so…IT’S ACTION SUNDAY AT LANDSHARK’S, BABY! THAT COUCH OR RECLINER SLOWLY SUCKING YOUR SOUL, MAKING YOU UNABLE TO MOVE!? NO PROBLEM! DELIVERY GUY IS STANDING BY: (850)424-6743 – 5 TO 9PM, From Destin Bridge to Destin Commons & Crystal Beach Areas. Smokin’ Hot SPORTS ACTION On Our Army of Big Screens! NBA Runnin’ & Gunnin’ CLEVELAND CAVALIERS vs BOSTON CELTICS, HAWKS vs PISTONS, ROCKETS vs MAVERICKS, & THUNDER vs TRAILBLAZERS! NHL Hugs & Kisses DUCKS vs SHARKS, FLYERS vs GOLDEN KNIGHTS, BRUINS vs DEVILS, PENGUINS vs BLUES, Flames vs Islanders, Canucks vs Stars, Avalanche vs Sabres on tap! College Hoops Excitement #6 CINCINNATI vs SMU, #9 DUKE vs GEORGIA TECH, #20 MICHIGAN vs WISCONSIN, SYRACUSE vs WAKE FOREST, Louisville vs Pittsburgh, UCF vs Memphis, Colorado vs Stanford & more! PGA TOUR Golf AT&T PEBBLE BEACH PRO-AM FINALE! Also, PRO SOCCER & PRO TENNIS Coverage, Sports News, Updates, Highlights & Analysis! Previous Post: « Landshark’s College Hoops ALL TOP 5 TEAMS IN ACTION! 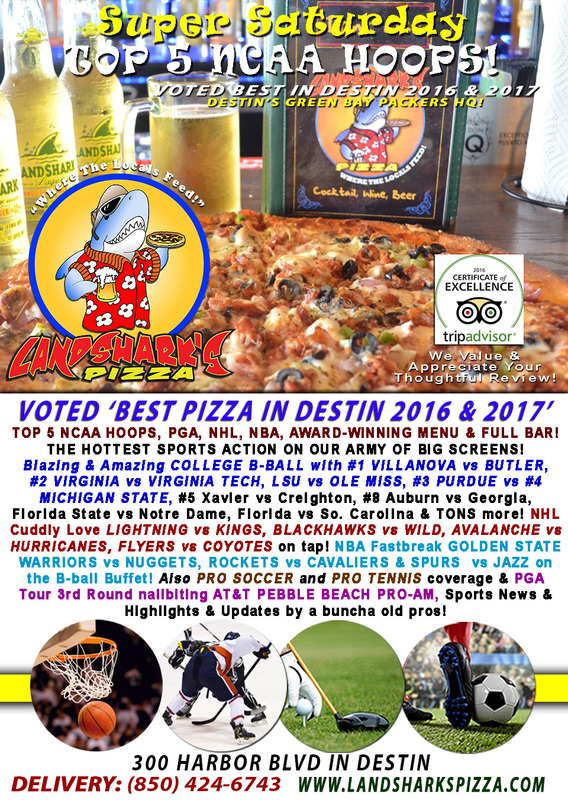 Award-Winning Menu & FULL BAR|NBA WARRIORS vs SPURS & more!